Lucebert (pseudonym of Lubertus Jacobus Swaanswijk, 1924-1994) was born in Amsterdam, the city where he lived for almost 30 years. In the 1950s he settled in Bergen (North Holland) with his wife and family, the place where he was to live for some 40 years, until the time of his death. It was the experimental and enigmatic quality of his verse that was to make Lucebert a sensation in the early ’50s. He was instantly embraced by the literary avant-garde of the day but eyed with great suspicion and unease by the Dutch establishment whose very foundations he rocked. An energetic and prolific writer and artist, he saw the publication of 15 collections of poetry. 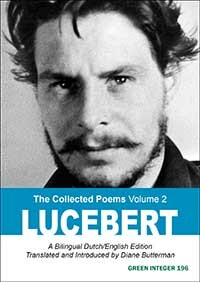 After his death, all these collections, together with numerous uncollected and posthumous poems, appeared in one large volume (Bezige Bij, 2002). His legacy includes thousands of paintings and drawings. Today, 60 years after his literary debut, he is universally acknowledged as an established and acclaimed poet throughout the Dutch-speaking world. The four collections in this second volume were published between 1952 and 1959. The accompanying uncollected poems date from the 1953 to 1963 period.